Minty-ness presented at its best is the results you can expect to yield when you order your NJoy Daily Disposable Cool Menthol E Cigarette. This close-as-you-can-get to the real thing replica embodies all the desirable qualities of traditional disposable cigarettes, without the lingering smoke stench or the inhalation of burning carcinogens. This eCig is equipped to produce 300 puffs. This is great news for those ready to make the jump from traditional cigarettes to e-cigarettes, who don’t want or need to be bothered with overly-technical vaping devices, boasting properties you don’t understand nor care about. The best part is once you’ve used up your generous 300 puff allowance from this eCig you just throw it away and unwrap your backup eCig for your hundreds of puffs. If you’re not taking the hint, we’re saying it’s probably best to order more than one of these convenient vaping delights so you’re prepared when yours finally gives out. This particular flavor offers cool, menthol to ice over your throat and lungs, making your pull from this eCig as smooth as possible. Like a breath of fresh, arctic air, the menthol allows you to not only hold on to the convenience of having a disposable eCig, but also mimics the flavor of your former bad-habit buddies, better than any replica on the market. Once you finally make the leap from traditional to e-cigarettes you’ll be so happy you did. It’s just about making that small click on the order button from Breazy and you’ll get to keep the taste of your coveted, menthol-flavored throwaways of nicotine delivery without as many negative side effects. 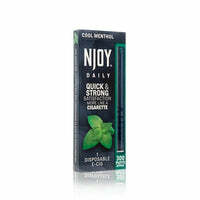 Pick up a few NJoy Daily Disposable Cool Menthol E-Cigs and you’ll feel as though you’ve never even switched, for the difference in flavor and convenience will be unbelievably unnoticeable. Welcome to the world of disposable cigalikes.